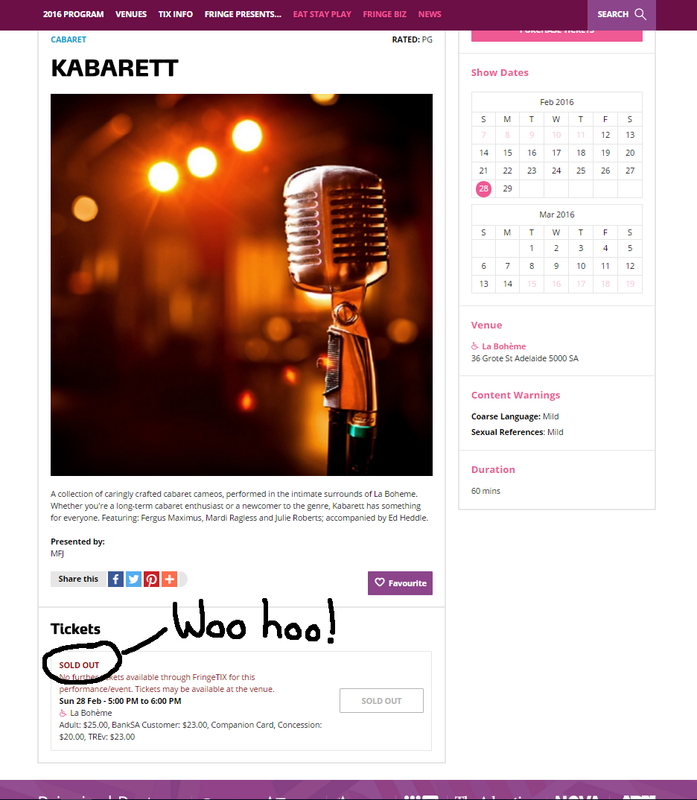 Yes, you heard correctly: our Kabarett Fringe Show has sold out! (People have been accusing Ferg of selling out for years but this is the first time that’s actually a good thing). Opening night of our Kabarett Fringe show on Sunday night was fantastic. We had an excellent crowd and the vibe was great. The team at La Boheme did a great job of juggling multiple shows and a good time was had by all. There are still some tickets available for our final show on Sunday, 28 February but you’d better hurry because they are selling fast. You can pick them up here. Ferg is performing in the Fringe for the first time (he’s performed *during* the Fringe before but that’s a different thing). And did we mention that it’s a cabaret? What the …? Cabaret? Seriously? What’s that all about? 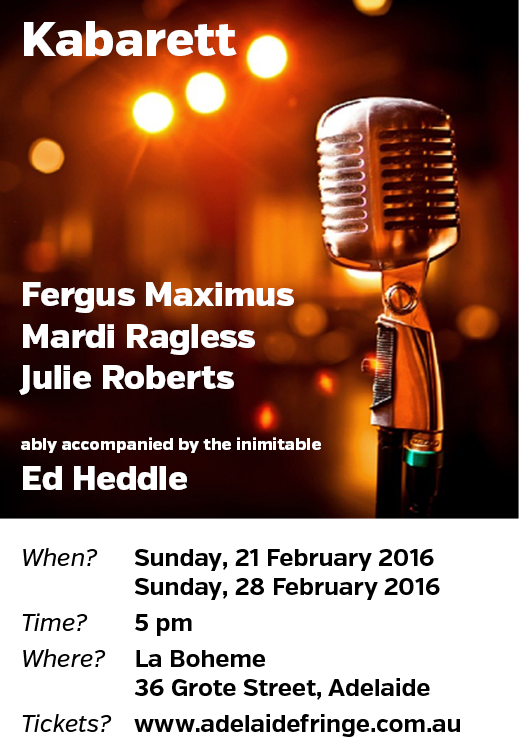 Well, Ferg’s friend, Julie, was organising a cabaret show for the Fringe with another friend, Mardi. They decided they needed a third person who wasn’t a girl and invited Ferg to be that person. (You won’t believe how surprised he was to discover there are people who don’t think he’s a girl*). Ferg decided that Fringe time is when you take risks so he agreed quickly before he could chicken out. (And, yes, he did have to google ‘cabaret’ to make sure he knew what he was getting into. Turns out it’s all about telling stories and that, as we all know, is his bag!). Ferg, Julie and Mardi are each doing cameo sets, all three ably supported by the wonderful pianist, Ed Heddle. Ferg has reimagined a handful of his songs with piano accompaniment and they are sounding great! Oh, and it’s called ‘Kabarett’ (the German way, apparently). You can get tickets here (or just google ‘Adelaide Fringe’, then search for ‘Kabarett’). *Kidding, really. He’s only occasionally mistaken for a girl.